This quote sums up perfectly what I’ve come to realize about weather and storms over the past 10 years of studying, forecasting and chasing them, and the part that I find most fascinating. On each scale level from synoptic-scale, which covers areas the size of multiple states, all the way down to micro-scale, which could be an area as small as your backyard, the fluid which we call air abides by the same universal physical laws of nature and thus acts in a very similar manner and patterns. A cold front, for example, is a phenomenon which is widely understood to mean a large scale line of advancing cold air, hundreds of miles long, along which supercell thunderstorms sometimes form. Within these smaller storm-scale environments, something called a rear-flank gust front forms on the southern end of the low pressure area of the mesocyclone, where the rain cooled air wraps around. This is effectively a storm’s cold front. The cool air is more dense than the warm air, and because of this, advances into the region of lower density, just like the larger cold front on which the storm formed. The stunning supercell storm structure we see is along these relatively small, storm-scale cold fronts. This is what forms the “hook” on radar. Here, just as with the larger scale weather systems, the wedge of denser cool air at the surface meets the warm, moist, buoyant air in front of a storm, forcing it aloft and through the cap where the potential energy is realized. Given the right conditions, this development can be explosive. The ingredient based explanation for supercells includes moisture, wind shear, instability and lift. I prefer to focus on the big picture. 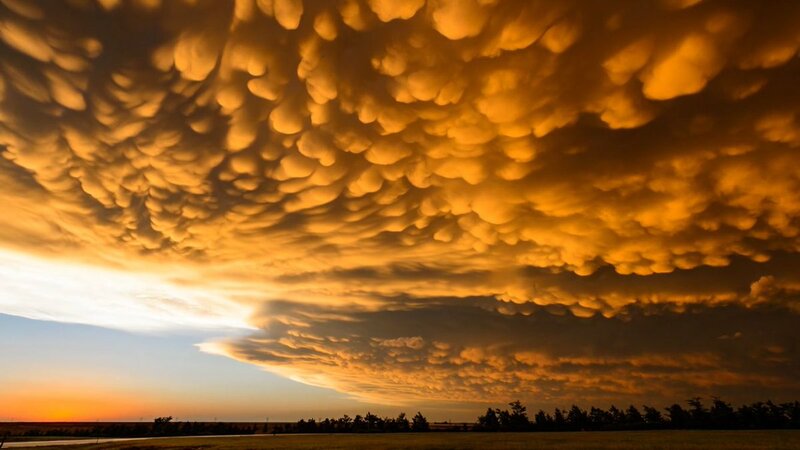 Supercell thunderstorms are a manifestation of nature’s attempt to correct an extreme imbalance. The ever ongoing effort to reach equilibrium, or viscosity, is what drives all of our weather. The force with which the atmosphere tries to correct this imbalance is proportional to the gradient. In other words, the more extreme the imbalance, the more extreme the storm. While Richardson’s quote is more regarding turbulence than thermodynamics, his theory from nearly 100 years ago that our atmosphere behaves as a fractal has turned out to be spot on. A “top down” transfer of energy and behavior occurs, resulting in a Russian nesting doll of smaller scale systems that bear a striking resemblance to the larger. I am ready to die having seen this! This entry was posted on March 3, 2018 by Vox Populi in Art and Cinema, Environmentalism, Music, Poetry and tagged Arvo Part, Awakening in the Age of Climate Change, Chad Cowan, climate change, extremes in weather, Fractal, Fractal -- 4k StormLapse, Lewis Fry Richardson, storm fronts.